There's a dispute over sidewalk plowing in Concord, New Hampshire, and it many say resulted in the death of a homeless man earlier this year. 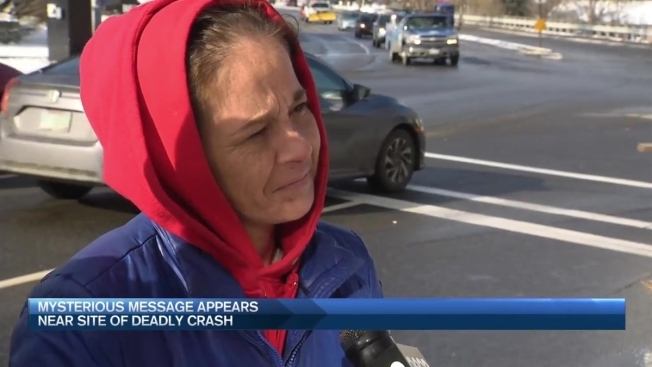 After the first snowfall of this season, a mysterious message showed up near the fatal crash site. It was written on a wheelchair, which was chained to a pole. It is unclear who is responsible for it, but by the looks of the sidewalk Tuesday, the question apparently remains unanswered. "Just a couple inches more and I'm getting whacked," said pedestrian Shawn Downs, who has walked the I-393 bridge for the last 10 years. The route is a necessary one to get to the city's soup kitchen. "It's the only place I know that does it three times a day, especially in wintertime," said another pedestrian, Jonathon May. And when there's snow on the ground, the sidewalk isn't plowed. "I was just walking against traffic in the road," May said. "I literally have to take my chances in traffic," Downs explained. Those chances turned deadly for a homeless man in a wheelchair last January. Gene Parker's friends say he was hit by a car and killed – because the snow-covered sidewalk forced him into the road. "It was devastating to everyone who knew him I think," said Amanda Truchon. In time for this season's first snowfall Monday, a mysterious message on a wheelchair was left near the spot where Parker died. "I think it's a great message," Downs said. And necn tried to get an answer to the question written in black ink — "State of NH or City of Concord?" The city manager declined an on-camera interview, saying the 393 sidewalk is a state-owned sidewalk and referred necn to the Department of Transportation. NHDOT Spokesperson Bill Boynton told necn the department has a longstanding policy and practice of not maintaining sidewalks. Both sides say they're working toward a solution – but many people are afraid of what could happen in the meantime. "Someone needs to take responsibility and fix it," Truchon said. "People are dying." The city says there is an alternate route to the soup kitchen that avoids the bridge. It's a half-mile longer and people say on a cold winter day, it's not a reasonable alternative. The Friendly Kitchen issued a statement Tuesday saying they will be offering bus passes and taxi shuttles from downtown locations to help guests avoid traveling on snowy or icy sidewalks.